Leather Construction – Softer and more durable than plastics, conforms to your body – Lasts longer, more comfortable. Custom Molded and Tooled – Better retention, stylish look. 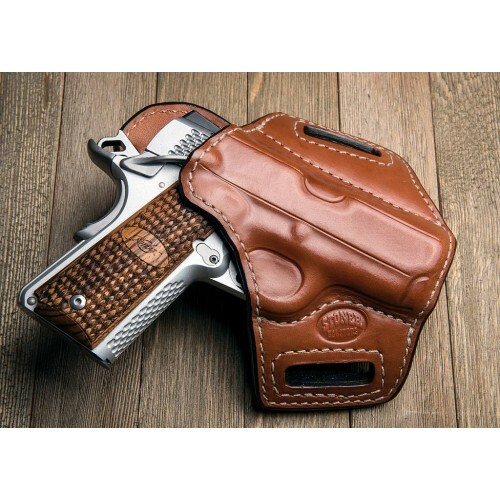 2 Belt Slots – Holds the holster tight against the body – Easier to conceal. Leather Lined – Sturdy Construction, low profile, smoother draw, protects the finish of the gun better. Full Leather – Covers the entire barrel of firearm – Easier concealment than FBI, Protects firearm from scratches and finish damage. Forward Cant - Tilts firearm forward – Gives you the optimal draw angle, helps conceal the firearm by moving the grip of firearm forward. Outside the Waistband – More Comfort.